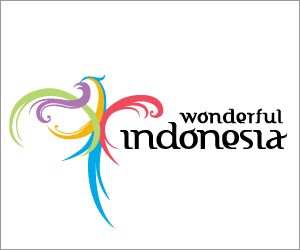 Borobudur is one of the most famous Buddhist ruins in the world and Indonesia’s single most visited tourist attraction. This ancient Buddhist monument is located on an elevated plain, called Kedu Plain, between the Progo river, the twin volcanoes of Sundoro-Sumbing and the twin volcanoes of Merbabu-Merapi, of which Merapi is one of the most active volcanoes in Indonesia. The site is in central Java, about 40km (25 miles) northwest of the city of Yogyakarta in Indonesia. Borobudur is the biggest of the three Buddhist ruins in the area, which includes Pawon and Mendut, and is aligned in one straight line. Although there is no documented proof, according to a folk tale, there once was a paved brick road that ran from Borobudur to Mendut, with walls on both sides. Borobudur was inscribed as a World Heritage Site during the 15th session of the World Heritage Committee which met in Carthage, Tunisia, on 9-13 December, 1991. Borobudur is built to encase a hillock that is 265m above sea level. According to archaeologists, it is also 15m above the floor of a dried out ancient lake. Borobudur is believed to have been built on the lake shore, or may have even been an island on the lake. W.O.J. Nieuwenkamp, a Dutch artist and scholar of Hindu and Buddhist architecture, theorised in 1931 that Kedu Plain was once a lake, and Borobudur represented a lotus flower that floated on the lake. His theory found support among geologists who discovered clay sediments near Borobudur. There is no written record to show who constructed Borobudur or why, but based on its carved reliefs, scholars believe that Borobudur was constructed around 800 AD. That corresponds to the peak of the Sailendra dynasty of Central Java. Sailendra, meaning “lord of the mountain”, was the name given by historians rather than actual name. It was coined to relate to sailaraja, meaning “king of the mountain”, used by the kings of Funan, from whom the dynasty was said to be descended. 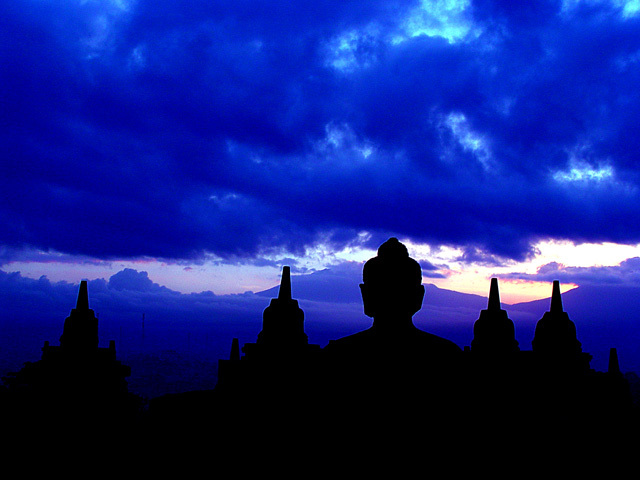 Borobudur is built to illustrate the Buddhist mandala, or cosmos. It consists of three sections: the base, the square platforms and the circular platforms. Construction of Borobudur was estimated to have taken 75 years, and the completion was believed to be in 825 AD, during the reign of the Srivijayan Maharaja Samaratunga. It was around the same period that the Hindu temples of Prambanan was constructed. The Sailendra Dynasty collapsed in 832 AD when Prince Rakai Pikatan of the Hindu Sanjaya Dynasty conquered the Sailendra kingdom, and took Princess Pramodhawardhani, daughter of the Sailendra King Samaratunga, as his wife. Members of the Sailendra household that managed to escape took the Sailendra prince Balaputra into the forest and raised him in secret. In 850 AD Prince Balaputra mounted an unsuccessful attempt at regaining the through but was defeated. He escaped to Sumatra where he took the throne of the Srivijaya kingdom with little opposition. With the demise of the Sailendra Dynasty, the Sanjaya dynasty established a Hindu kingdom credited for building the Prambanan Temples, also near Yogyakarta. By the time Stamford Raffles – the founder of Singapore – rediscovered Borobudur in 1814, the ruins have already been abandoned for centuries. It is not known when the massive ruins was abandoned, and why. Among the theories put forward includes a massive volcanic eruption in AD 1006, that resulted in the inhabitants of Kedu Plains moving east to Brantas valley. Another speculation is that Borobudur was abandoned as the population converted to Hinduism and then to Islam. To say that Raffles rediscovered Borobudur is not entirely true, because he did not set foot to look for it himself. The few sentences of instructions issued by Raffles was all the world needed to credit him with the rediscovery. Upon hearing about this marvellous ruins deep in the jungles near the village of Bumisegoro, Raffles sent a Dutch engineer by the name of H.C. Cornellius to investigate. It was Cornellious who employed 200 workmen and over a period of two months, set forth to clear the vegetation and earth, to reveal the buried ruins. He found that the structure was unstable, so he did not unearth all the galleries. He did report back his findings to Raffles. The Anglo-Dutch Treaty of 1824 saw the delineation of the Malay archipelogo between British Malaya and Dutch East Indies. It resulted in the British administrators leaving Java. The Dutch administrator of the Kedu region, named Hartmann, continued the escavation of Borobudur that was begun by Cornellius. In 1835 Borobudur was fully unearth for the first time in many centuries. Subsequent wave of Dutch engineers further documented Borobudur. The earliest attempt to preserve Borobudur began in 1885, when Yzerman, the chairman of the Archaeological Society of Yogyakarta, discovered the hidden base of Borobudur. The discovery garnered public attention to the monument, leading to the Dutch government take steps to safeguard it. A commission was set up to access the monument. In 1907-1911, restoration was carried out according to the principles of anastylosis. It was headed by Theodor van Erp, the Dutch army engineer officer. The grounds around the monument was escavated to look for missing buddha statues and head. The circular platforms and their stupas were dismantled and restored them. By the time the restoration work was completed, Borobudur looked better than it had centuries earlier. But it was shortlived. Within 15 years, the gallery walls start to sag. There were signs of new cracks and general deterioration. Due to limited budget, van Erp had concentrated on cosmetic restoration and had not put in place a proper drainage system. Now alkali salts and calcium hydroxide from the concrete used in the reconstruction leeched through the stones and hastened their erosion. A more thorough restoration is needed, and fast. In late 1960′s, the Indonesian government sought help from the international community to restore Borobudur. In 1973 a restoration master plan was put in place. Between 1975 and 1982, the Indonesia government, with help from Unesco, dismantled the whole monument, cleaned all 1,460 panels, put in place a drainage system and reassembled Borobudur. The monumental project rivalled the restoration of Abu Simbel Temple. Around 600 people were involved in the project, and it cost US$6,901,243. Upon completion of the restoration work, inscribed Borobudur in 1991 as a World Heritage Site.